In September 2009, Amir Mogharabi presented a performance entitled Stone, at X Initiative in the former DIA space on West 22nd Street in New York. 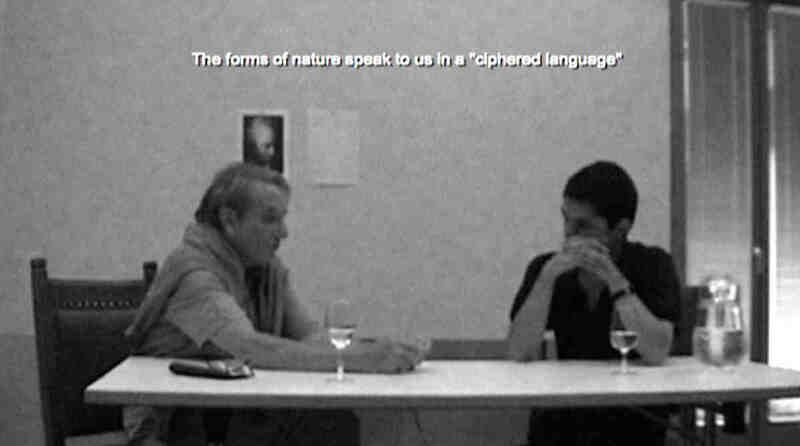 The piece was built around videotaped, one-on-one conversations between the artist and three icons of contemporary philosophy: Michael Hardt, Sylvère Lotringer, and Jacques Rancière. In each, a table separated the artist and his guest, and on the table sat a stone. Two stones, actually: a hard-edged chunk of gleaming pyrite — “fool’s gold” — and an irregular igneous mass several times larger, into which the pyrite was set. The composite was about the size of a baseball, and the men onscreen debated its evocations and origin, pondering it as natural object, art object, and philosophical object. In other words, this was the quintessential philosopher’s stone. All puns intended. Mogharabi, for his part, claimed nature as the stone’s true origin and maker. But by the end of the project, the stone had acquired new provenances, conceived by the artist and philosophers, all equally true. This possibility, of multiple beginnings, is a seminal concept within Mogharabi’s sprawling practice. At the conclusion of the performance, Mogharabi jolted the stone’s history into action, flinging it across the room at the glass displaying the video’s subtitles, hence propelling another beginning. The glass shattered, and what remained in the aftermath of this event were a pile of random shards and the dust of lofty assertions. Still, the artist maintains that philosophy is not his medium, nor does he advocate an agenda for conceptualizing his art. Instead, Mogharabi calls the project of conceptualism a lie that purports to privilege ideas over objects, as if the two were not yoked. Which is not to say that Mogharabi always disdains dishonesty — he believes in the creative potential of a well-wrought lie, which repackages an empirical truth as new and improved. At its best, Mogharabi’s work explores these tensions between an object and its life, and by extension, all the lies in between. He assigns significance to each of his actions only after they’re completed (though in his universe, nothing is ever truly completed). Repurposing sequentially, the artist terms his dizzyingly reflexive march towards meaning “retroactive reasoning.” It’s no stretch to imagine the paths that stem and splinter from an initial happening. After performing Stone at X Initiative, Mogharabi kept the stone and gave the variable “X” (no relation) to the geometric pyrite and “Y” to the unruly material encasing it. He later named these variables Coco Du Nom (X) and Allais Young (Y), two pseudo-pseudonyms to which he assigned specific, Jekyll-and-Hyde parameters for making art. These modes of production were inspired by the conflicting physical properties of the stone(s): “Coco Du Nom intentionally works under rational constraints; Allais Young attempts to forfeit intentionality altogether,” he explains. Thus uncritically outsourcing absolute methods of making work, Mogharabi situates the work he credits to himself between poles of pure rationality and pure intuition, a black and white that key a full spectrum of grays. To maintain a genuine presence of mind, one can only do one thing at a time, act or reflect. This is true for an artist, who can at any moment either move a practice forward through action or backward through reflection. Movement in either direction is gainful, but to try to go both ways at once results in something of a confused wobble. Mogharabi devoutly separates action from reflection in order for his art to structurally emulate thought. His entire output can be read as an essay built of intuitive gestures that he interprets and edits after they have come into existence. This is how Mogharabi recasts philosophy as art: by approaching art as thinking or writing, never-ending processes that evolve through the retrospective evaluation of previous iterations. Weeks after his project at X Initiative, Mogharabi summoned the stone again to shatter another pane of glass, this time as part of an installation at Front Desk Apparatus in Soho. Only this time, contact with the glass split the stone itself into two pieces, dislodging X from Y. The total accident as a symbolic incident illustrated the fundamental autonomy of X and Y, how rationality and intuition only ever merge in temporary, constructed arrangements. Throughout Stone, there was no inherent coalescence of idea and object. The two united later as story, which becomes history over time. The heart of Stone was indeed about making connections — between idea and object, X and Y, action and reflection — but its beat was felt in the gaps that separate those pairings. The split that occurred at Front Desk Apparatus essentially cast the underpinnings of Stone into stone. Mogharabi retired the two pieces to a new life as a sculpture — for now, at least. Despite the seeming finality of that gesture, if he were ever actually to end Stone, that could be the final blow to shatter the meaning of his whole endeavor. Although Mogharabi is never working toward anything definite, his work is in constant progress. Pressed to answer what’s next, he only offers “the unexpected; indeterminacy; but, always evolving from what has already happened, and then determining how the evolution occurred, retroactively.” In other words, he doesn’t know, and that’s the point. One element of Mogharabi’s practice assumes the form of a written publication called Farimani, which gathers writing on art, music, and theory. He claims to know nothing about its path other than that each volume will grow in physical size until the eleventh and final volume. (Farimani exists online, too.) 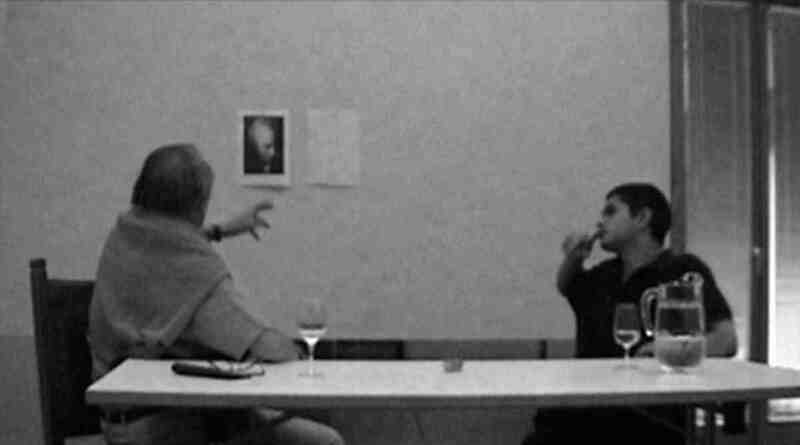 As for live events and objects, on the evening of April 20, 2010, Mogharabi presented the sixth in a series of lectures at the site of the former X Initiative, to be followed by his participation in ‘Greater New York’ at P.S. 1 Contemporary Art Center and a summer project at the LISTE Fair in Basel. The coordinates are set — though it remains to be seen what will unfold at each subsequent meeting of X and Y.